The protests against the Keystone XL pipeline have already focused a great deal of attention on the Conservatives’ terrible environmental record and if Obama rejects the project it would deliver a major blow to their tar sands oriented economic policy. It could also precipitate a sort of existential crisis within the ardently pro-US Conservative party. The Conservatives are worried that if Keystone XL, Northern Gateway and other export pipelines are not approved, Alberta’s oil will continue to sell at a steep discount from international market prices. This might imperil the industry’s plan to triple tar sands output over the next two decades. Of course that is hogwash. The Conservatives have limited room to maneuver. The Obama administration knows full well that a large portion of Canadians dislike the Prime Minister and oppose tar sands expansion (they are desperate to get Keystone approved partly because they are having difficulty building pipelines through BC). A recent New York Times business article speculated that Ottawa was threatening to pull back from purchasing Lockheed Martin’s F35 fighter jets if Obama doesn’t approve KXL. While many would rejoice at such a development, from the government’s perspective this would be like cutting off its nose to spite its face. Their friends among the military leadership and Canadian military industry would not be pleased. 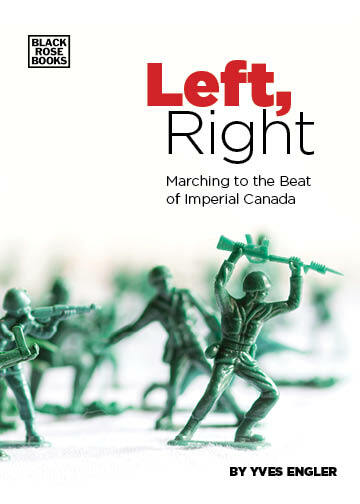 More generally, militarism is a bedrock of the Conservative ideology. And being pro-military in today’s world means supporting the US, the leading global military power. Alongside that pro-American outlook, the Conservatives have pushed to deepen continental integration on a host of security and economic issues. Are they going to back away from these efforts? It’s doubtful. The Conservatives have angered so much of the Canadian public with their wedge politics and belligerence that they are limited to their core 35% slice of the political pie. And that core is precisely the pro-military and pro-continental integration segment of Canadians. Stephen Harper’s government is locked in an unprecedented battle with the largest climate movement in US history. If the environmentalists win, the Conservatives may not fully recover.